The second European corn borer (ECB) generation is lingering at low levels, primarily in central counties (see ECB map). As always, consider treating when the number of infested plants in a 50 plant sample exceeds 12%. Any planting remaining at or above threshold as it proceeds to full tassel should be treated, as this is the last stage at which ECB larvae will be exposed and vulnerable to insecticidal sprays. See the 2015 Commercial Vegetable Recommendations Guide for insecticide choices. Corn earworm moth (CEW) activity has stabilized over the past week, with low-to-moderate catches throughout the state (see CEW Map). At current levels, CEW remains a significant threat to silking sweet corn plantings. CEW moth catches in the limited CEW pheromone trap network in the southern counties have changed very little over the past week, with high catches remaining in Cape May and parts of Camden County. Overall activity is fairly consistent throughout the south, resulting in a broad area where a 4- day silk spray schedule (blue area) is recommended (see CEW blacklight map). The somewhat more conservative scale of the pheromone map indicates a 3-day schedule (green areas) in much of south Jersey. 3-day schedules are warranted throughout southern NJ at this time. Fall armyworm re-infestation rates remain very high. This pest can be devastating to small corn plants. Fields down to seedling stage should be scouted weekly for signs of infestation. FAW do not respond well to pyrethroid insecticides. The most useful products are those in the IRAC group 28 class (Coragen, Exirel, Belt) or the IRAC group 5 class (Radiant, Entrust), or combination products including these classes. See the 2015 Commercial Vegetable Recommendations Guide for insecticides effective against FAW. Late blight remains active in a limited area of central Morris County. With rain forecast for late this week, conditions will be favorable for this disease. All tomato growers should be protecting their late crops against this disease. Growers with early tomato plantings that are no longer producing a viable crop (and which are no longer being treated with fungicides) should consider eliminating these plantings as a potential inoculum source. This may be done by physically removing plants or applying a chemical desiccant to the foliage. Cabbage loopers (CL) continue to infest tomato plantings, with noticeable foliar injury to many plantings. This pest typically does not impact fruit production, although under extreme pressure, some injury to green fruit may occur. 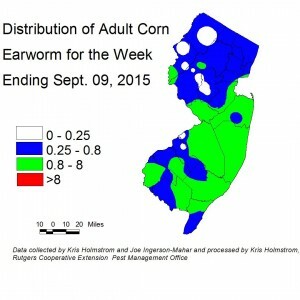 BMSB numbers remained very low in NJ blacklight traps this past week. These catches are too low to create a map. As yet, no fruit injury has been discovered in scouted pepper plantings. Cucurbit downy mildew (CDM) is active on many cucurbit crops at this time. The intensity of infections varies by crop and location, with fields that retain leaf wetness for longer periods more heavily infected. For more information on the regional presence of DM as well as comprehensive, weekly forecasts, see the following website: http://cdm.ipmpipe.org/ Growers should consider applying both protectant and systemic fungicides to all cucurbit crops at this time, to limit loss from this disease as well as powdery mildew. Be alert to the possibility that striped cucumber beetle may return to pumpkin and squash fields as the crop matures. These beetles may feed on rinds of mature fruit, reducing their marketability. Giant pumpkin varieties and Hubbard squash are particular favorites of this pest. If beetles are found at 2 or more sited in the field, and fresh damage is noted, consider an insecticide application. Be sure to time applications to avoid contact with bees. Hawaiian beet webworm (HBWW) adults have increased in pheromone traps in southern NJ, and larvae have recently been discovered in various greens in Atlantic County. 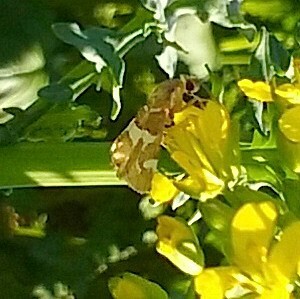 The adult is a small brown moth with white bars across both wings (see photo – courtesy of Tonia Broen). This pest favors beet greens, Swiss chard and spinach, although some larvae have been found in mint plantings in the Landisville area. Damage occurs directly on leaves, with larvae spinning protective webbing on the underside of leaves. Heavy moth populations may be found in dense stands of galinsoga. Several years ago, HBWW did extensive damage to host crops like spinach from Atlantic through Monmouth County before growers were aware of the problem. At this time, all south Jersey growers should check spinach, beet and Swiss chard plantings for signs of infestation.